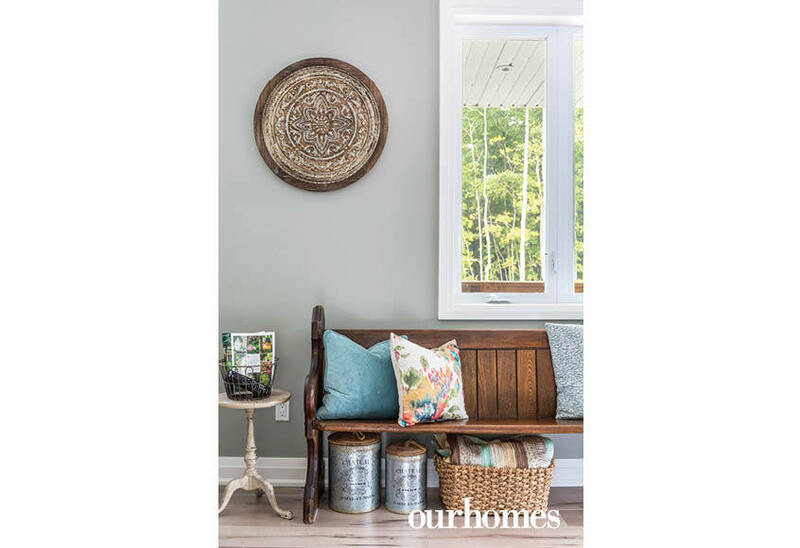 A version of this article originally appeared in the Spring 2019 issue of OUR HOMES Grey & Bruce Counties, p.68. 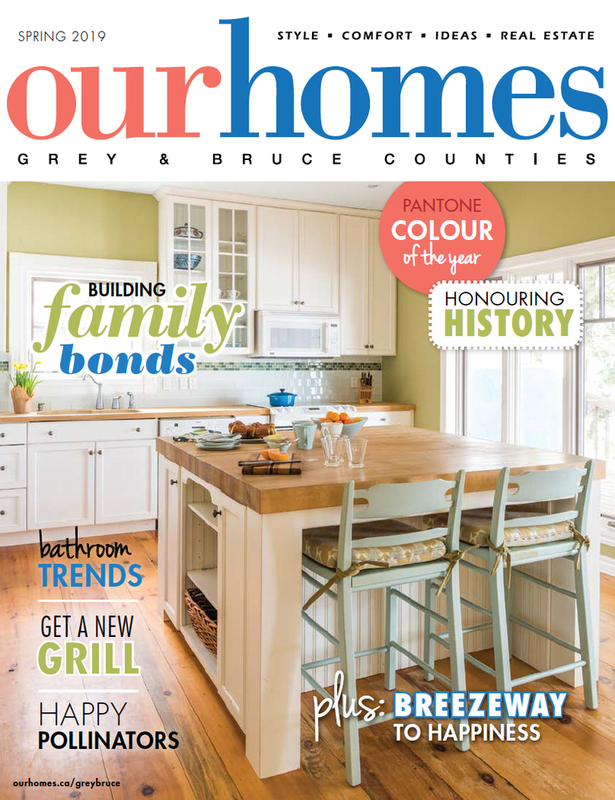 Find local businesses in our Grey Bruce directory. Simon and Courtney Dietz spent two summers clearing the land for their new home with the help of their family. 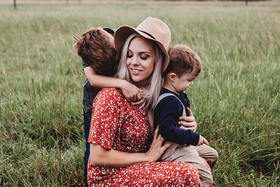 The family cherishes that experience, building bonfires with their two daughters and learning first-hand about their new property together. “It was a joyful, bonding time,” remembers Courtney. 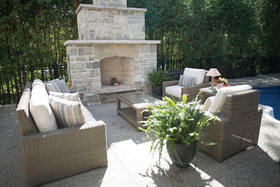 The Dietzes credit much of their positive experience to Don Tremble and the team at Candue Homes. They customized their chosen house plan, including creating a lower level specifically for the girls. 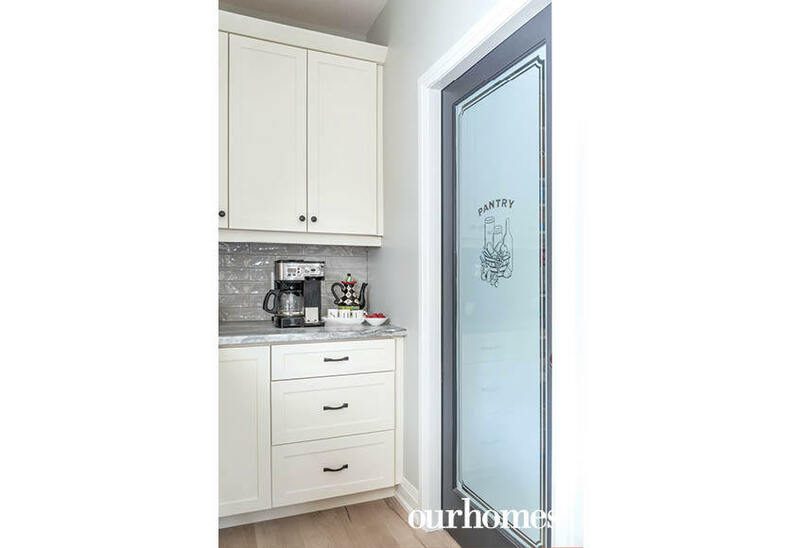 The finished basement now has three bedrooms, a full washroom and an additional living room – a perfect space for recurring family sleepovers. 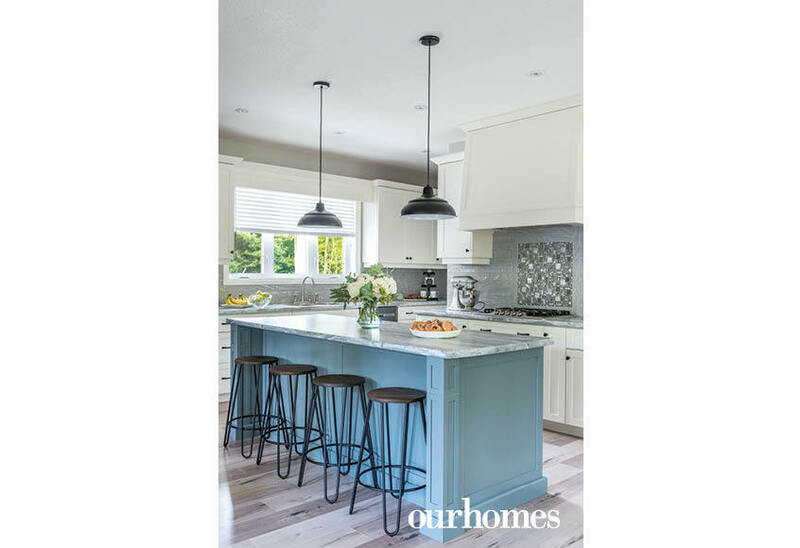 The heart of the home, though, is the large, bright custom kitchen, provided by Barzotti Woodworking Ltd. Tile came from House Rules Design Shop. 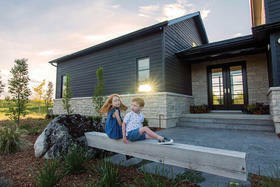 The finished product – a bit of country, with a touch of contemporary beach house – is comfortable and relaxing, showcasing Courtney’s flair for design, “I think your home should include what you love: colours, patterns, shapes.” For the Dietz family, that meant bringing the outdoors inside, with colours and textures inspired by the large yard just outside their windows, leading to 40 acres of forest beyond. 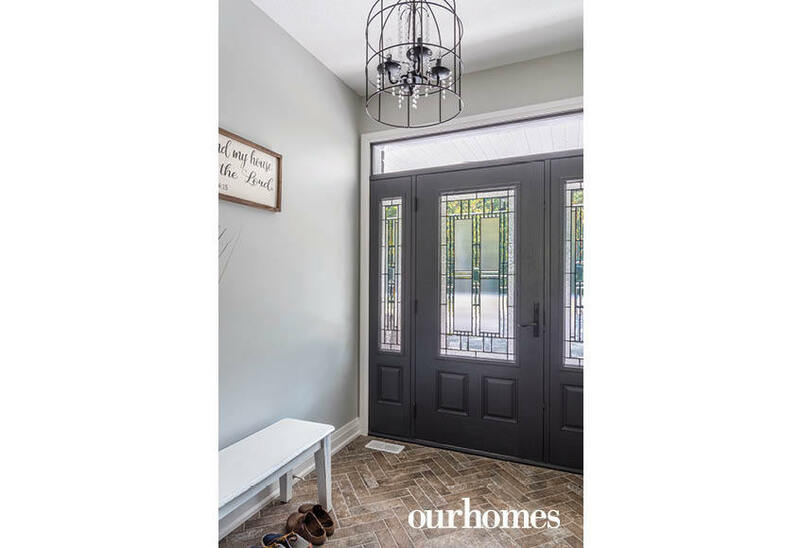 Black accents pepper their way through the home, including those in the Twelve Oaks Modern Maple flooring, chosen specifically for its dark knots combined with the bright, natural colour. Bright tones continue in the lower level, where the girls’ area takes its cues from another of the family’s favourite locations: the beach. 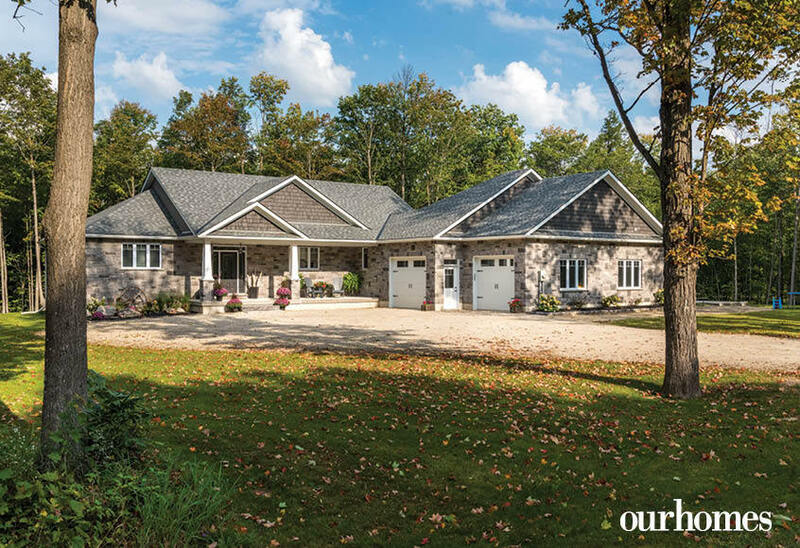 With a nod to Craftsman style, the multiple roof lines and the staggered garage give the front facade of the home a welcoming and protected feel. Colourful gardens soften the exterior Shouldice Wiarton stone. 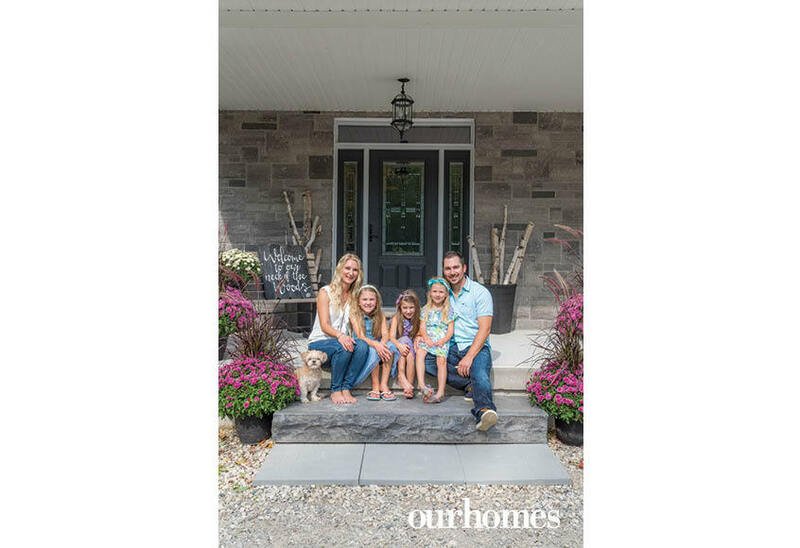 The warmth of the day is enjoyed on the front steps by homeowners Courtney and Simon Dietz, their daughters and their family pup Ruby. 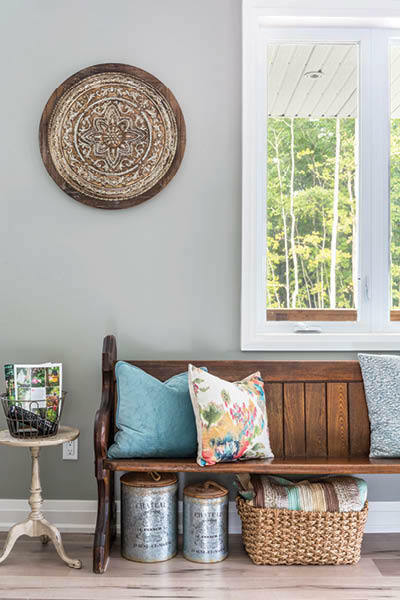 Stained glass detail in the front door offers privacy but also lets the sunlight shine in. The Fox Trot tile, laid in a herringbone pattern, is from House Rules Design Shop. 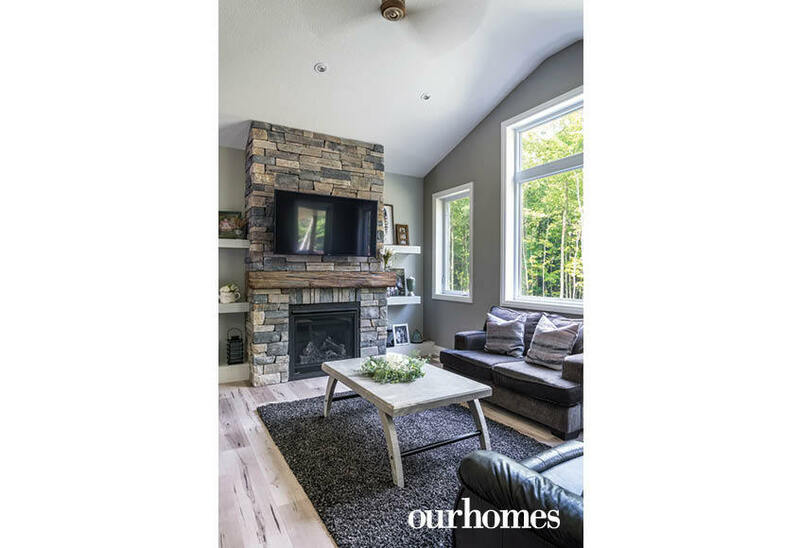 The stone fireplace is the centre of attention in the living room. 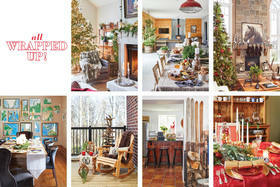 Its texture and colour palette work with the furnishing throughout this space. Floating shelves on either side display family mementoes and photos. The church pew adds extra seating in the kitchen area. Using the space beneath for storage is a practical and attractive solution. 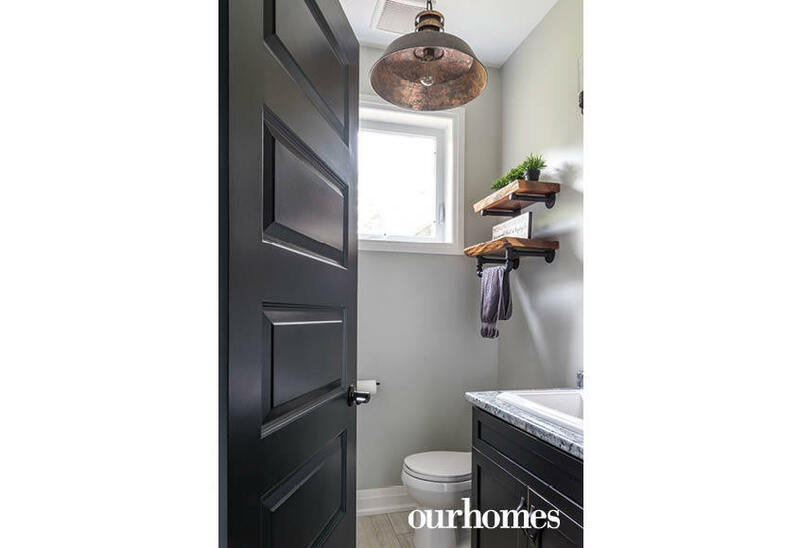 In the guest bathroom, industrial floating shelves and a barn-style pendant inject a rustic charm. 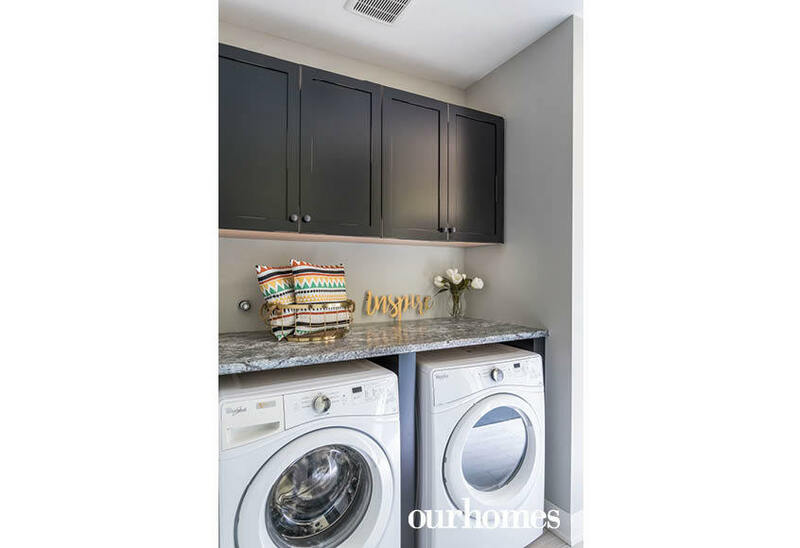 A warm grey was used on the walls throughout the main floor. 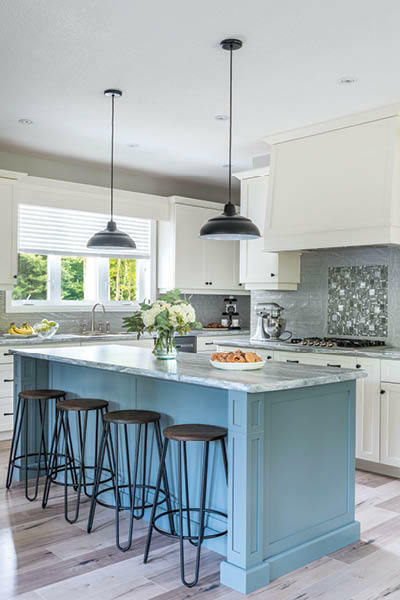 Painting the island Templeton Gray by Benjamin Moore is an on-trend way to inject colour and make the island look like a piece of furniture. 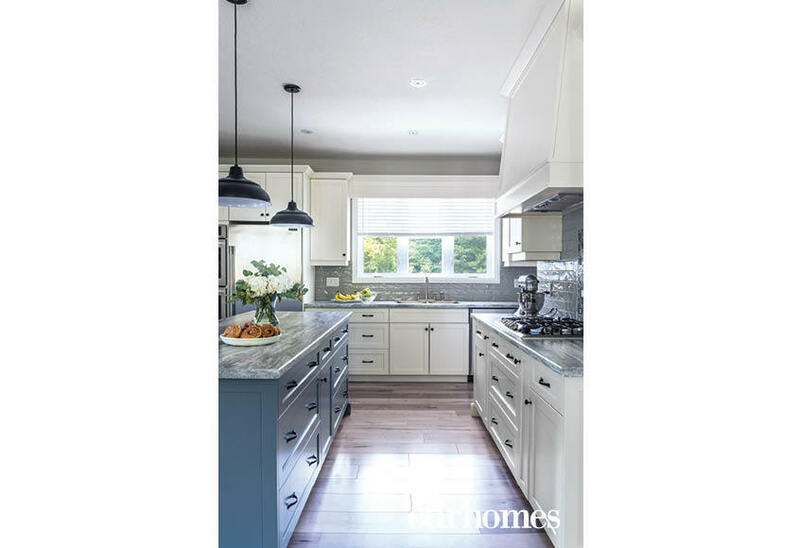 Formica Fantasy Marble covers all the cabinet surfaces. Looking behind the island reveals lots of drawers and cupboards. Standing at the sink is a chance to look out the window at the beautiful property. 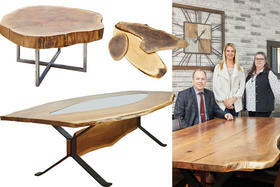 The custom cabinets and fan hood are from Barzotti Woodworking Ltd. The pantry’s frosted door lets light in. A convenient coffee station is tucked away from all the cooking action at one end of the counter. 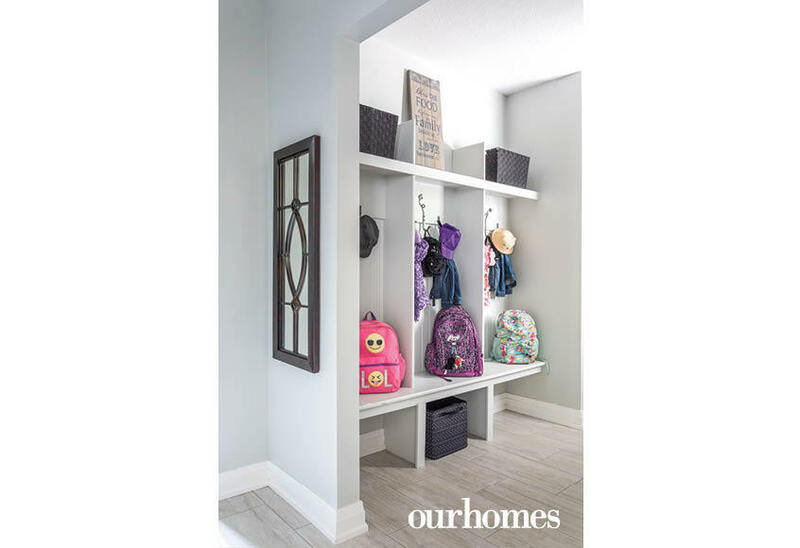 Built-in cubbies for the girls keep all of their gear organized and separated to make getting out of the house an easy task on busy school day mornings. On these warm spring days, the direct access to the garden makes it easy to hang clothes on the laundry line to dry in the sunshine. Overhead cabinets store cleaning supplies out of sight. The serene master bedroom gives the owners a place to recharge and relax. Adjacent to the master is a large walk-in closet. 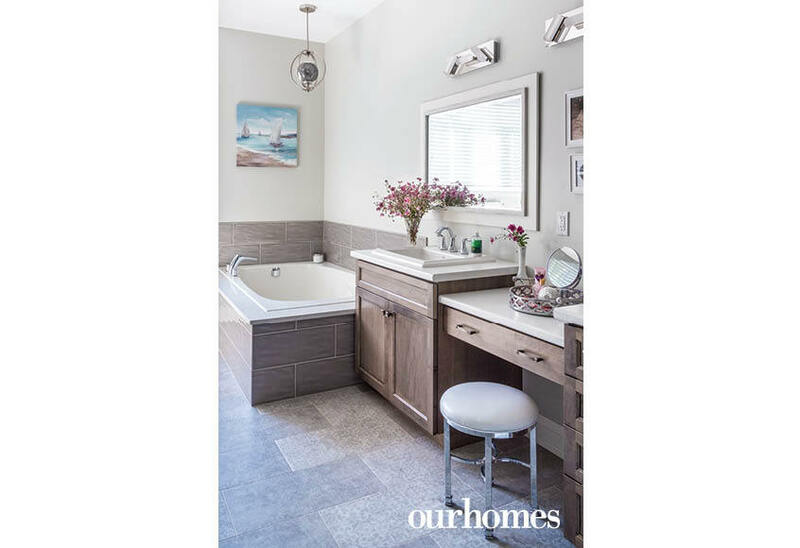 The master bathroom’s large built-in bathtub has a handy deck for candles, towels, and a nice glass of wine. The wall space for the double vanity allowed for a make-up station in between the double sinks. 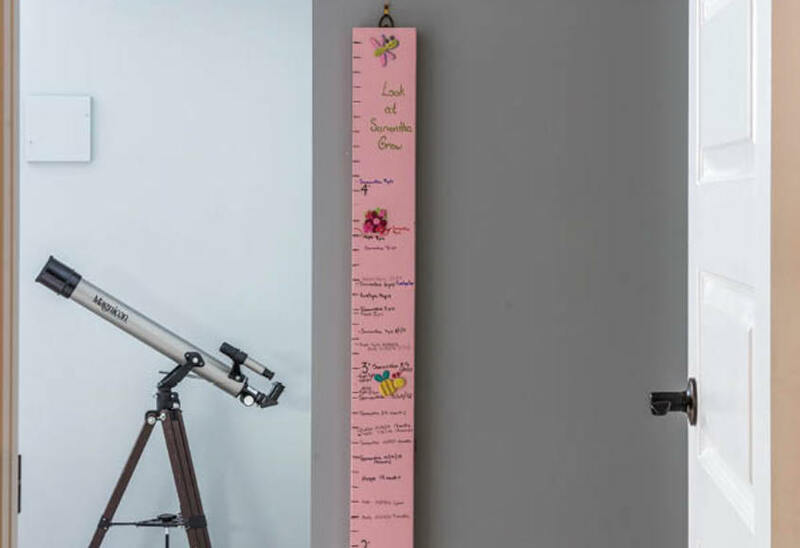 Signs of growth: a telescope and a growth chart. A happy little girl reads in her beautiful bedroom. Turquoise is one of her favourite colours and unicorns her favourite animal. 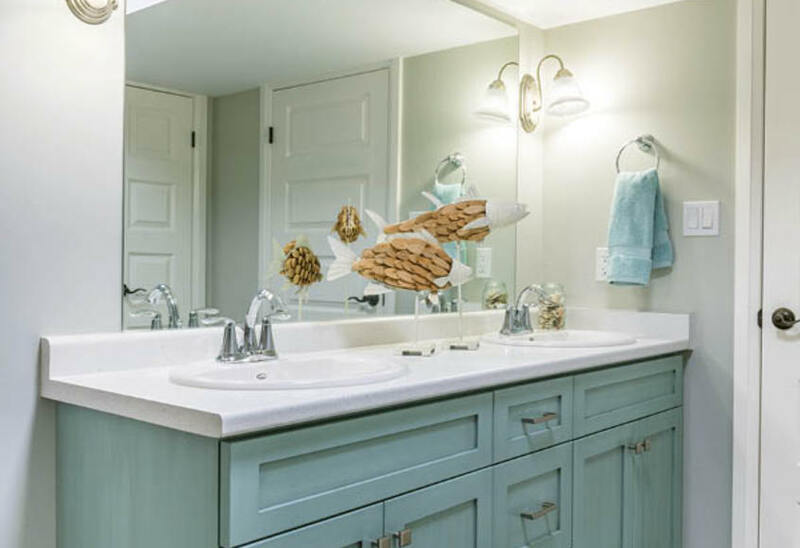 From the flying driftwood fish to the colour of the vanity, the beachy theme in this bathroom will bring back happy memories of days spent on sandy beaches, picking up rocks and shells. 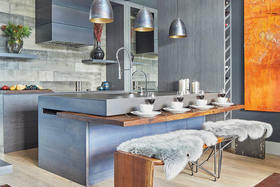 The Formica Arctic Snow counter floats above the cabinet, painted Rhine River by Benjamin Moore. The lower level space was created just for the children, so they have their own area to relax. 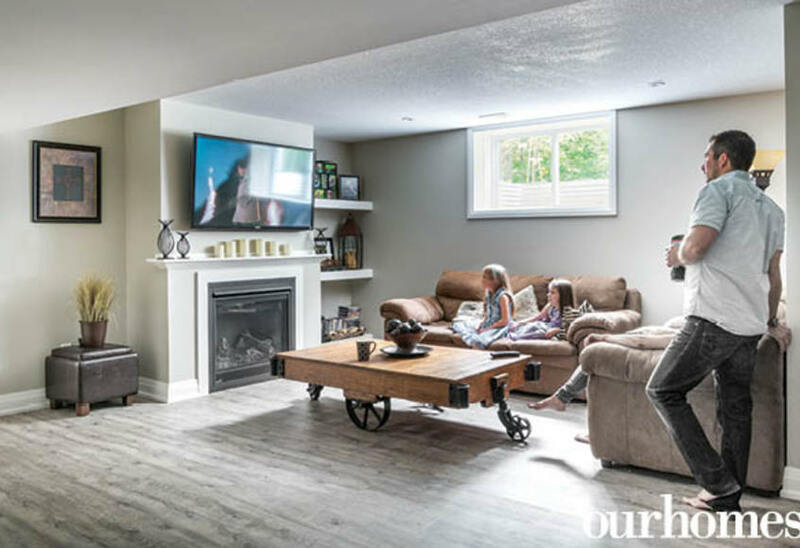 The comfy couches are perfect for the whole family to curl up on and enjoy a movie night.